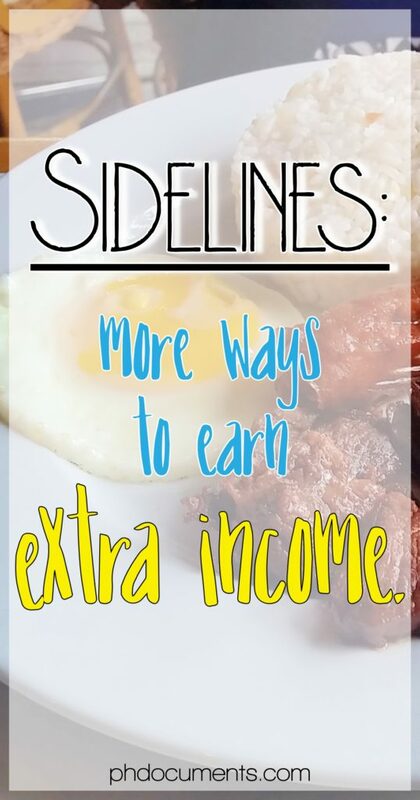 Having a sideline is something that’s very common for Pinoy workers. We all have that one co-worker who passes around brochures at the workplace – selling food, clothes, bags, and the like. Some of us just feel the need for an additional income, or perhaps just business-minded by nature. That is probably something that I lack: a business mindset. Which is why I am surprised that looking back, I actually engaged into a few sidelines over the past few years. I remember joining a networking company twice, which oddly enough, is the same company. I joined them when I was barely 16, then left, and joined again four years later. I failed in both instances, which I took as a sign that talking in front of people is not the right path for me to get somewhere. Anyway, here are some of the most common sidelines that anyone can explore. 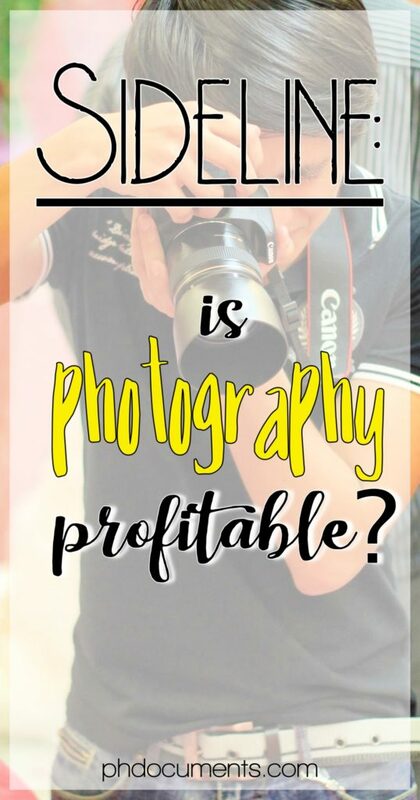 If you have an expensive DSLR camera, or if you can afford one, why not make money out of it if you have the talent and skill at photography? Most photographers started as a hobbyist, and slowly gained experiences from there. How to start? Obtain the knowledge and skills to be a professional photographer. The money in this industry largely come from wedding photography, so it is important to enhance your skill at taking portraiture. Join photography groups as a freelancer, and while at it, learn the ins and outs of the business. My team ran a wedding and events photography group for four years, and while the business was good, we parted ways and some of us went on to put up their own photography businesses. Pros: Big pay! We started at a very competitive rate at the beginning and consistently increased the rate for every six months or so. The experience is definitely worth it. Cons: The task is often too demanding. Weddings often require at least 2 photographers and 1 videographers. Depending on the package, a one man team can do the job, nonetheless. I use to receive a weekly “non-work” email from someone at the office for meal orders. I asked her to exclude me from her mailing list as I am not a fan of Asian foods, which is what she’s selling. But if burgers or sandwiches are on the menu, I would probably placing my order every week. Pros: You won’t run out of people who are getting hungry. Cons: When selling is not allowed at work. It was 2011 when I got interested about insurance and investment. Luckily, an advisor was kind enough to teach me the basics all via email. But I was too scared then to put my money at “risk”, so I never purchased a policy. Five years later, I got introduced to this again when a co-worker became a SunLife advisor. As I still don’t fully understand insurance and VULs, I asked her to do all the paperworks for me and show me my options. I trusted her because I see her at the office everyday, and I can ask her questions at anytime. Yes, she’s able to do her regular office job and her sideline as a financial advisor at the same time. Pros: Big commissions! Plus, it’s easier to sell insurance these days. Cons: Needs your time and commitment. Consider this only if you see yourself doing it full time later on. Blogging, if done right, can be profitable. In order to make money with a blog, you need to drive a significant amount of traffic into it. That’s the first factor to look at when you want to start a blog with profit in mind: quality contents that people will consume. In choosing a topic or niche, what people need is more important than your interest or passion. Your brilliant piece of writing wont really translate to cash if no one wants to read it. Ask yourself, are people searching for these topics on Google? Your content should attract netizens because they find it interesting, educational, or helpful. Always aim to offer “value”, and people will notice. When they do, that’s when the monetization begins. Pros: There are lots of free online resources about how to make money blogging. Cons: It takes time and huge patience to build a large following in order to keep a steady flow of traffic. Why not bring your products online? There are several apps that you could take advantage of such as OLX and Carousell. The good thing is, you can sell almost everything online – from your “pre-loved” clothes and accessories, to used gadgets or appliances. Take this as a hint: my last online purchase was a pack of ground Arabica coffee! The possibilities are endless. And with the current technology, you can do almost all of these at the comforts of your home. What other sidelines do you have in mind? When I discovered blogging in 2005, I never thought that bloggers could actually make money from their blog. All I knew then is that I just found a new hobby. I’ve had a few blog monetization experience later on in 2007 and 2008 when paid posts were a thing. But paid posts started to decline during the 2008 economic crisis, and I eventually stopped doing that. A fellow blogger introduced me to Adsense in 2010 but I never really took it seriously. I did earn a few hundred dollars for a span of two years, and that was it. While I was seeing others who were very successful at it (earning $500 a week! ), I thought I didn’t have the right niche, and that all niches that could generate high traffic and income are taken. It is not until seven years later that I realized how wrong I was. And so here I am, starting all over again. Cliché at it sounds, it is never too late to start. If you’d ask me when is the right time to start, my answer will always be – now. 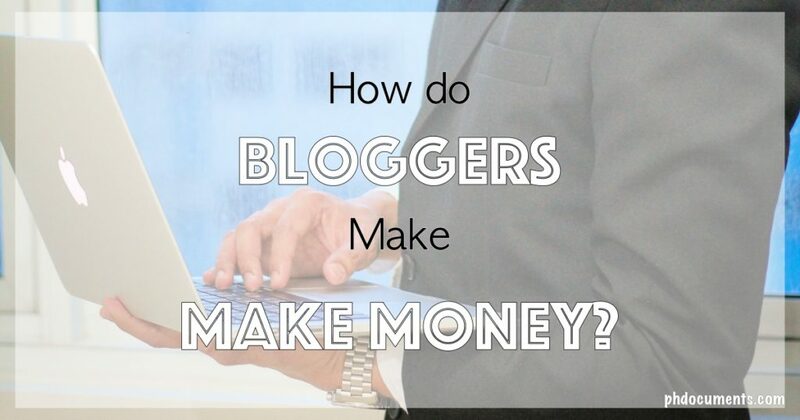 Here are the most common ways to make money from blogging. If you have a blog or if you are planning to build a blog, these may inspire you to keep going. Be very excited! This is as straightforward as it gets – look for blog competitions with subjects that you find interesting, determine if you are qualified to join, submit your entry, and if the organizers like it, you win a prize. I’ve joined three blog contests so far, and I won a gift check on my second try. But more than the prizes that you get to receive, the experience itself makes it all worth it. With sponsored posts, you get paid for creating and posting an article in your blog about certain products or services. The sponsor could be an individual or a company. You get paid for the post itself, and not on the sales or page views that they get to generate through your post. Unlike in a blog contest where traffic is often not a requirement, you will need to have a high number of monthly page views in order to attract offers for a sponsored post. This is similar to a sponsored post, but this time, you simply put a banner in a strategic location on your page and keep it there for a certain period. In short, your website becomes a digital billboard so your ad space value is dependent on your website’s traffic. A million page views a month will definitely entice advertisers to rent your digital space for an irresistible rental fee. Most high-earner bloggers are making thousands of dollars because of their affiliate marketing strategies. Affiliate marketing is when you get a commission for every sale that you make by displaying affiliate links anywhere in your blog. I am a newbie to affiliate marketing, and I honestly haven’t figured out how to make it work for me yet. Some bloggers who were able to “crack the code” say you do not necessarily need thousands or millions of page views in order to make money from being an affiliate. I am still learning, and I sure will share what I get to discover when I get there. There are lots of affiliate marketing programs available online, and based from what I’ve read so far, the most popular are Amazon, Bluehost, and Agoda. In Asia, Lazada tops the list. I am signed up with Amazon and Agoda and I can’t wait to find out how much my first payout will be. This is the most common and most popular amongst bloggers and other online content creators. There are several advertising programs available online, but Adsense is almost always the first option for many. I can’t remember how I got my Adsense account, but I think it was easier to get one back then. It was around 2008 when I signed-up, and my application was approved. 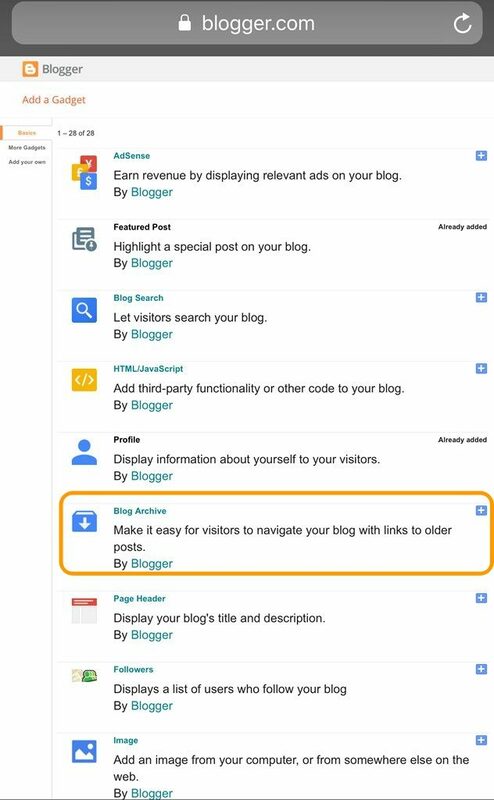 Today, Adsense now has certain rules that you or your blog should meet in order to get qualified. Once you got in, you will be provided a dashboard where you could generate codes that you can insert in any part of your page. These codes will display ads which are relevant to your topic or niche. 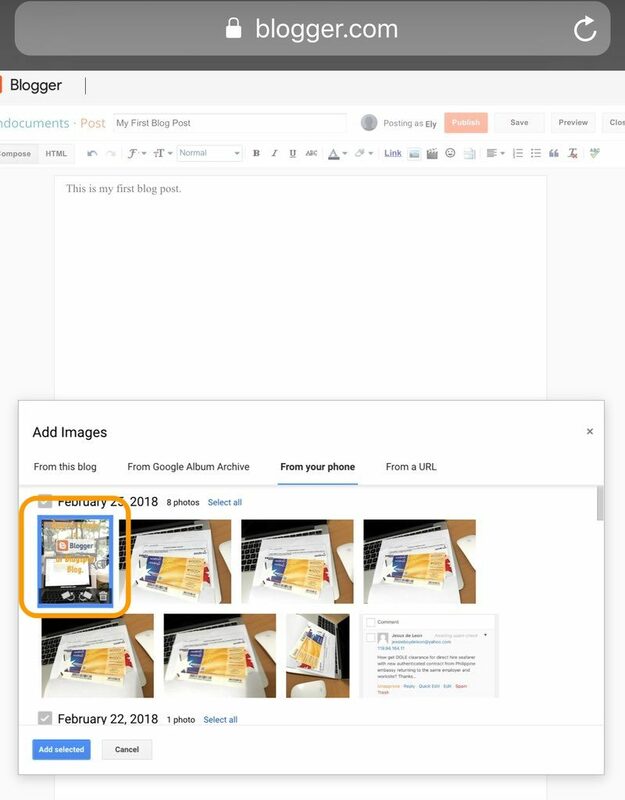 Say your article is about food, Adsense can detect that and will prompt it to display ads which are related to food such as restaurants, cooking or recipe sites, and the like. You get paid every month when you earn at least $100. Just like the other blog monetization programs mentioned above, traffic determines how much you can earn from Adsense. Adsense doesn’t disclose how earnings are computed, so there is no concrete way to know that. For one, it is dependent on so many factors. Not all ads generate the same monetary equivalent, and a page visitor from Northern America is more valuable to advertisers than a visitor from South East Asia. In short, advertisers pay more when the visitor is actually their targeted or preferred audience, which makes sense. Niches and page ranks could also be a factor. This is probably every professional blogger’s ultimate goal, to be able to create a product one day and sell it his or her subscribers. This could either be a physical product like a book, or its digital version, an ebook. Others are offering online or email courses about topics that made them endearing to their followers. Being able to sell your product without being too salesy is another thing. You have to earn your readers’ trust, and before you could do so, you must focus on giving them valuable content and information. If your followers see the value on the “free stuff” that you’ve been generously offering them, they wouldn’t think twice in paying to get more. It all boils down to the quality of your content, how engaging you are to your audience, and the manner and ways on how you respond in order to meet their needs. If you are able to achieve that, then you may have just opened your door towards becoming a full-pledged entrepreneur! And that is all because of having a blog. ﻿﻿﻿﻿﻿﻿﻿﻿﻿﻿﻿﻿ Exciting, isn’t it? I look forward to exploring all these options, one step at a time. For now, I am slowly taking the first few steps and I shall continue documenting my progress. WordPress is probably the most popular blogging platform amongst bloggers. 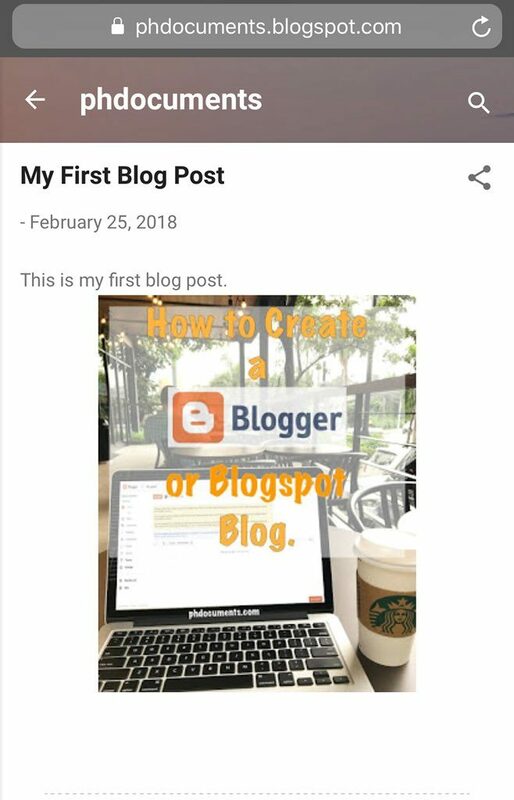 When I created my blog in 2017, I tried both WordPress and Blogger. 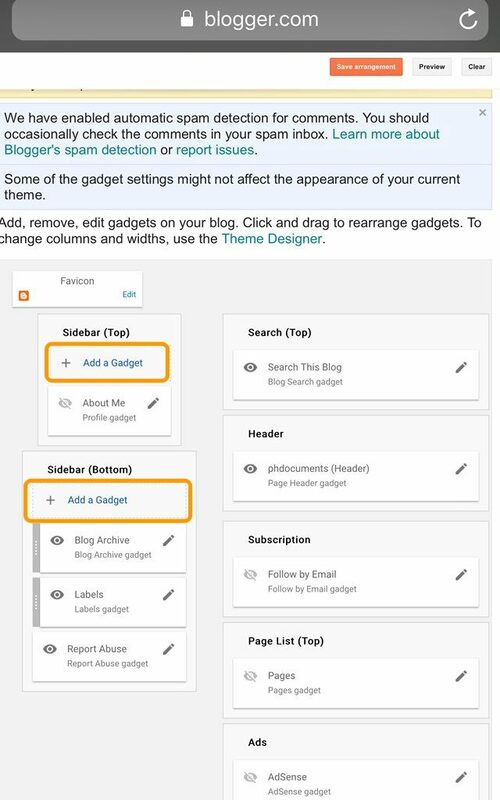 Some say the look and feel of a WordPress blog is more professional, but as a newbie back then, I found Blogger much easier to navigate. 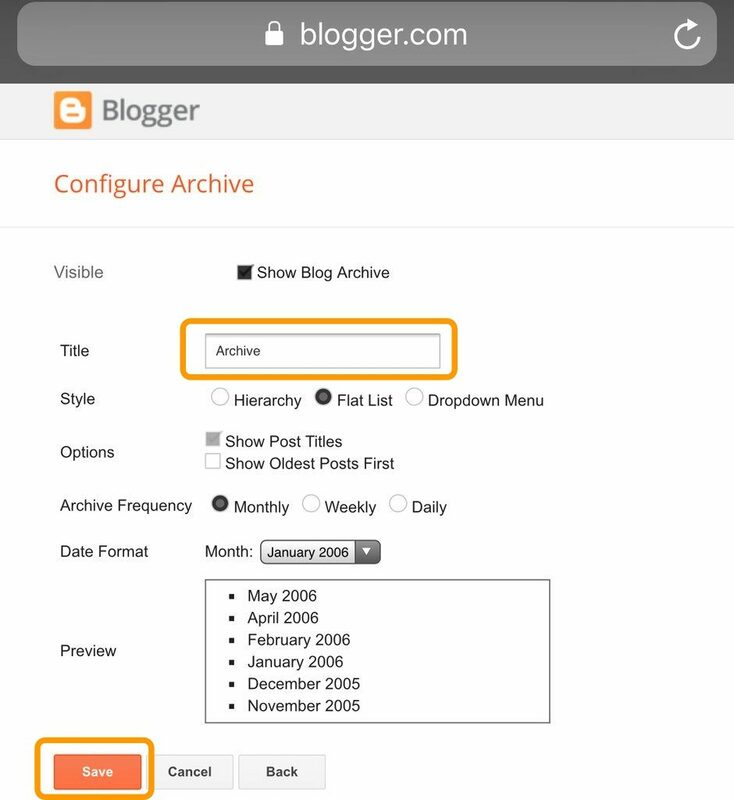 – How to Create a Free Blogger or Blogspot blog? Just like the confusion between Blogger and Blogspot, you may ask what the differences are between wordpress.org and wordpress.com. 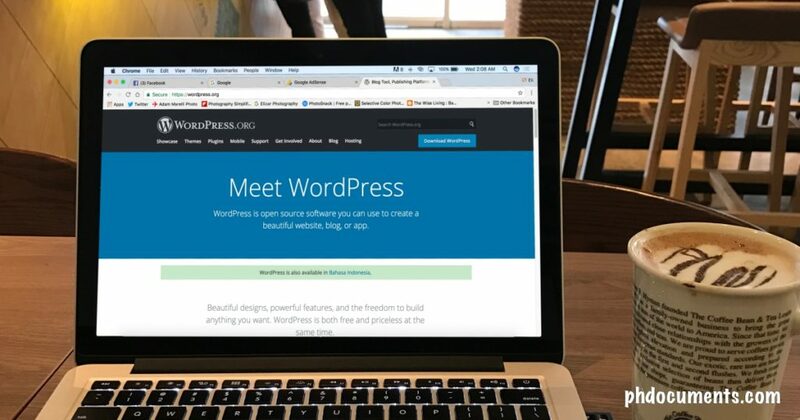 WordPress.org is where you get free websites, while wordpress.com is for self-hosted sites. Self-hosted sites are not free because you pay for the domain and hosting. If this website is not self-hosted, the URL would be phdocuments.wordpress.com. This is actually what I used to illustrate the instructions below. 4. 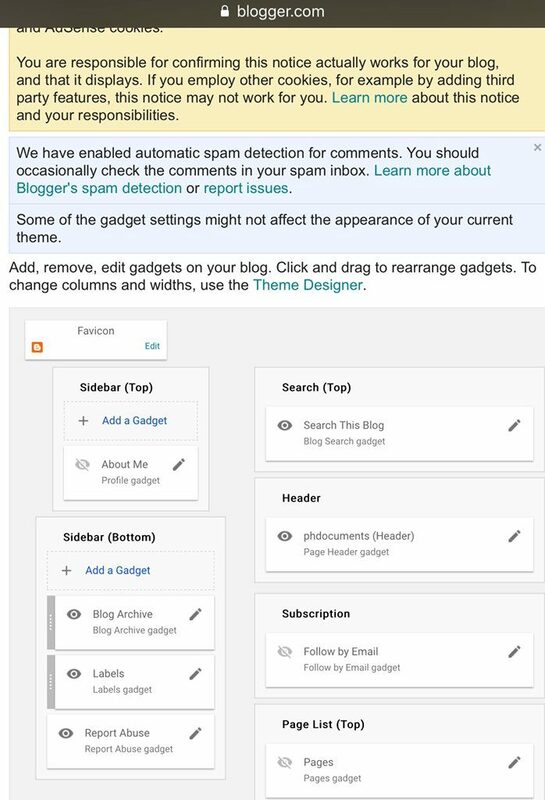 Upon clicking on the “Create Site” button, you will be directed to your Dashboard. These are only the basic steps and you can finish them in less than 10 minutes! Work on your theme and layout as you proceed. You may want to try all free themes to see which one you would like, along with adding or removing gadgets. 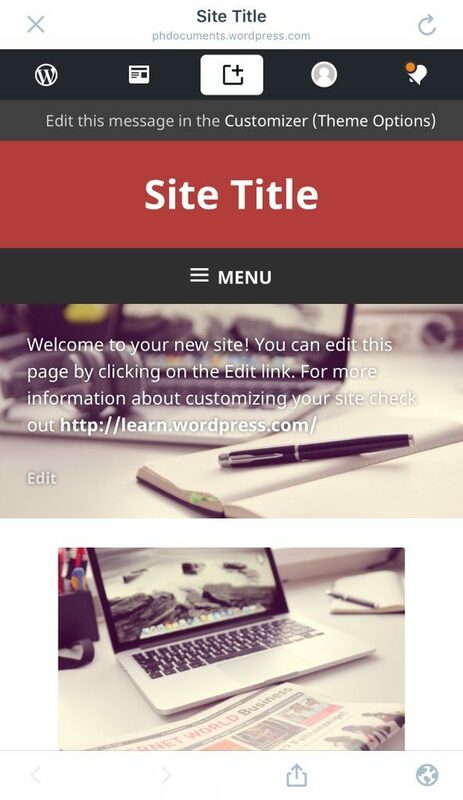 You can also upload and apply a theme from external sources; there are lots of free WordPress themes available for download online and most of them are easy to customize. Take time in building and organizing your blog, don’t try to finish everything literally overnight. It will take hours and days of work until you get the layout and look that satisfies your taste and preferences. It’s a long process and that is fine, I guarantee that it will be a fun and exciting experience! I wish you all the best! Ever wondered how food bloggers take those mouth-watering photos of their food? Have you tried copying their style, but you’ve never gotten that perfect shot yet? I’m not a food photographer, but my background and experience in photography taught me how to make a subject look interesting and beautiful in pictures. These subjects include food, and just like flowers and other small objects, I love taking macro shots of them. I have to be honest though, it’s a lot easier when you have a DSLR. And many food photographers are using DSLRs to capture those stunning pictures. To their credit however, one do not simply rely on the camera to do the trick. The end result, I have to say, has a lot to do with talent and skill. 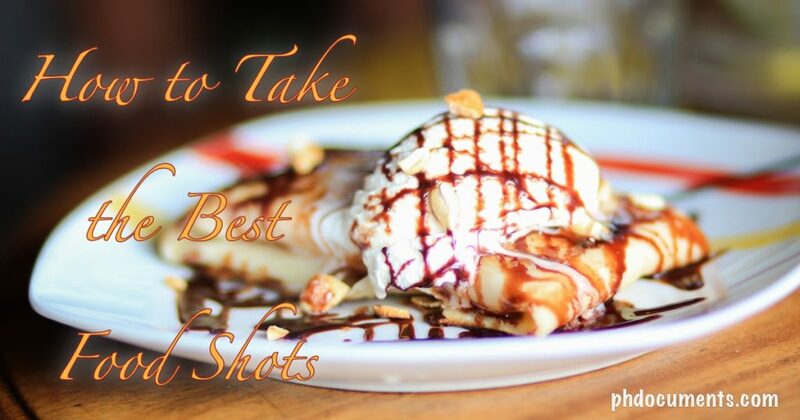 Which means, we do not necessarily need an expensive camera to take the best food shot. And the good news is, skills can be learned! If there’s ample lighting, make the most out of it. Carefully focus on your preferred portion to avoid taking an over-exposed image. If it’s too bright, tap on the brightest part so that the exposure will correctly auto-adjust. Fortunately, food shots don’t require a specific lighting condition so shadows are easier to manage. Unlike in portraits where you need to watch for dark spots forming under your model’s eyes, nose, and chin, there’s really nothing on food that you need to protect from shadows. Of course, you do not want the best part of the food to be dark, so shadow-wise, that’s the only thing that you need to check when taking the shot. Some suggest that we use natural lighting. This is applicable when there’s a pre-planned set up for the shoot, where you can utilize the light coming in through a window, or bring the set outdoors. 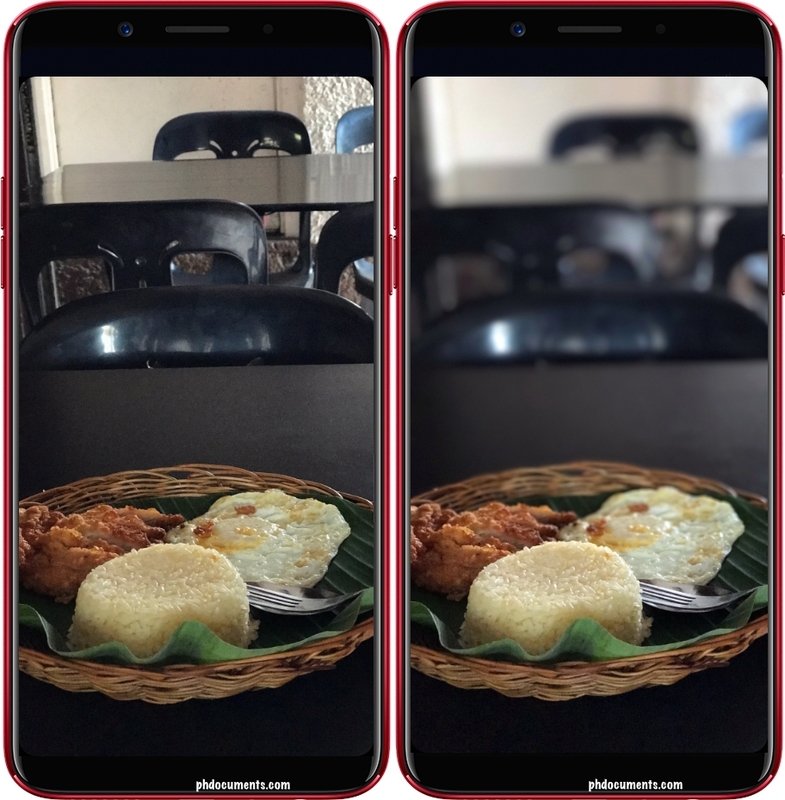 But if you are simply taking a photo of your food inside a restaurant, you will rely on the lighting available. The good thing is, most restaurants have cozy and warm lighting, and that’s exactly what we need to take beautiful food shots, more often than not. I do not recommend using a flash! All photos in this post were taken without a flash. Use the brightness control of your camera phone to brighten the subject before capture. The capability of the camera to produce better images in low-light condition lies on its aperture. The aperture is the opening that allows light in while taking pictures. The lower the aperture number, the better. The #OPPOF5 rear camera has an aperture of F1.8 which is high enough for a camera phone! This is sufficient for a camera to perform brilliantly for brighter and clearer shots in darker settings. As a comparison, a very powerful (and very expensive) SLR lens has an aperture that ranges from F1.0 to F2.4. This was taken at a low-light condition, shot from above and it worked! At the same time, it gives a crowded table vibe without necessarily showing who’s eating which. Yes, you can shoot from above, at normal level, and from below. Keep moving your phone to different levels, and take photos at different angles. Sometimes, an image becomes interesting when it’s taken from a very unusual angle. You can also use this technique to hide any distracting element in the background, or cut something that you do not want to appear in the frame. Say you don’t want to tag your location in your social media post, but want to give away a hint of where you’re at, show a little bit of a background in a very subtle way. But remember that this will make your food look smaller, like in the case of my yummy burger. Can you guess where this was taken? Original photo vs Instagram photo. Cropped images won’t look so bad with a high resolution camera. Note that cropping pixelizes a photo due to the zooming-in, and the process lessens the quality of the image. 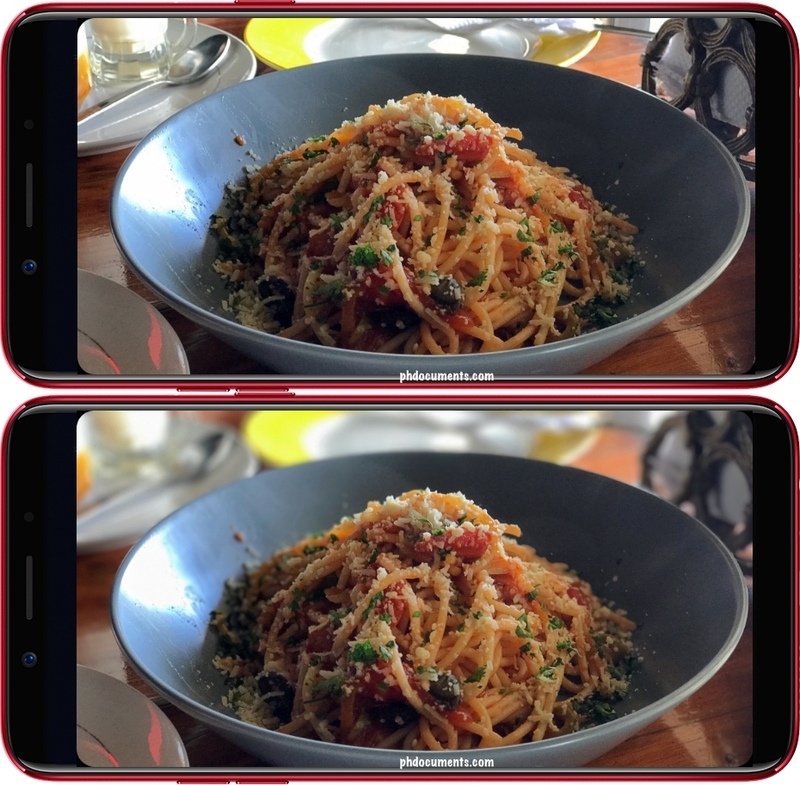 Your phone camera’s resolution will help in this scenario, and the higher the resolution, the better. 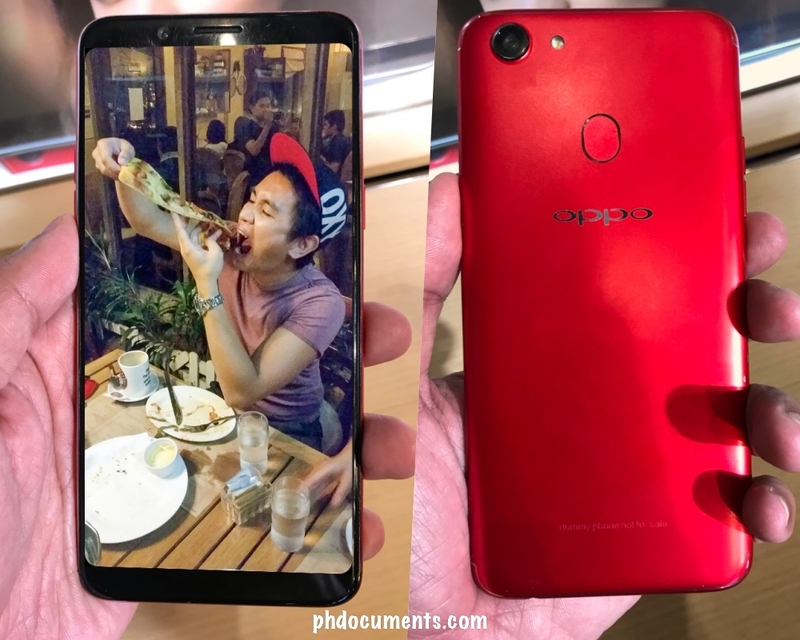 The #OPPOF5 for example, has a 20MP front camera and 16MP rear camera which are capable of taking clear, crisp photographs. This will come handy when you need to crop your images later on. While composing the image, try to add or remove other elements. You can either move your spoon and fork closer or put them away; try both and see which one would look better in pictures. You can include a phone, purse, glasses, or even the ketchup bottle on the side if that makes the composition look better. Give more life to a boring food, and make it look appetizing. 4. Make your food bokehlicious! This is my favorite part! Bokeh, in laymans term, refers to that blurry background or foreground of an image. In a DSLR, this is a result of having a low F number as an aperture. The lower the F number, the more blurry the background or foreground will be. In your phone camera, however, the bokeh is artificial. Its aperture only functions when taking pictures in darker settings, and it has nothing to do with bokeh. Nonetheless, the images that they are capable of producing are still undeniably impressive. Bokeh on phones may not work if you’re too close, and moving farther means including other objects in your shot. But that’s why you need bokeh in the first place, to blur out everything else other than your food. What do you need the bokeh for? To keep the focus on the subject especially when an unavoidable background is too busy. Say you’re eating with your friends and their hands are getting in the way, use bokeh to blur them out instead of asking them to move. It works a lot of time, and this is actually my single, most favorite trick! It never fails to produce a clean, lovely image. Use the bokeh feature on your phone, tap on the part of your food that you want the focus on, and everything else will be blurred. 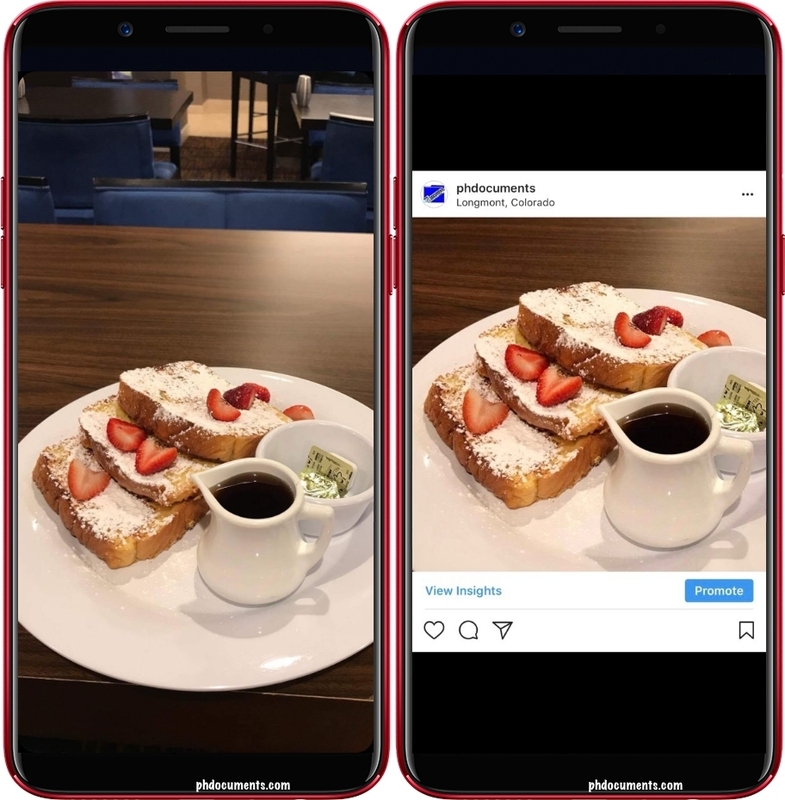 If you intend to use that “eating alone” caption on your social media post, then maybe show a proof? Of course, you want to still keep the focus on the food, and the right amount of bokeh is the answer! The #OPPOF5 20MP front camera has a bokeh feature. This can produce awesome selfies as such effect yields a pleasant out-of-focus backdrop, you become the main object of admiration with vivid details and brighter tones. 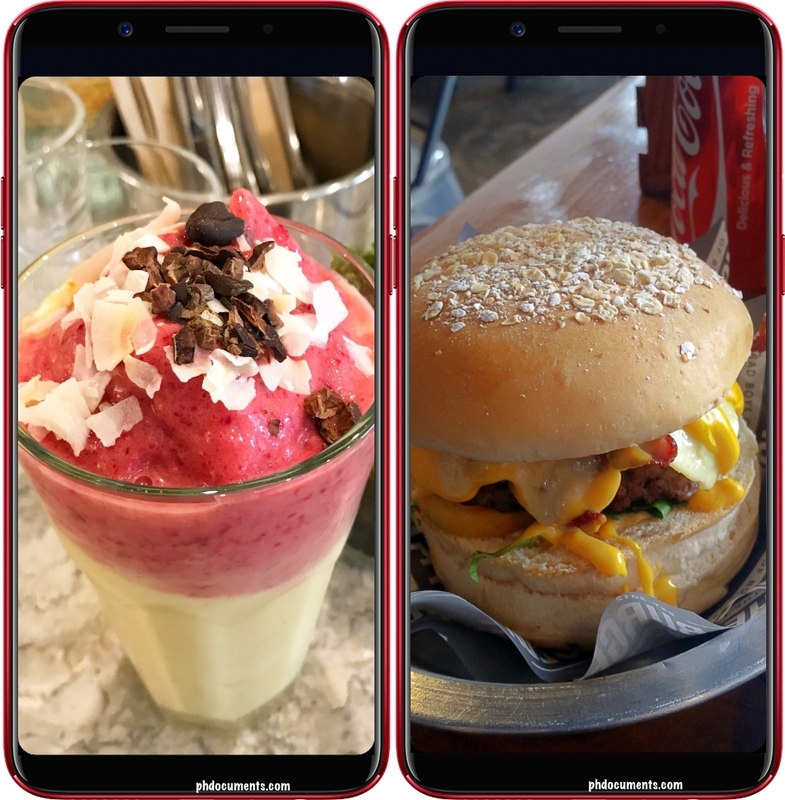 Go ahead and take a selfie with your food, and appreciate that bokeh effect! So the next time you bring out your camera phone for a food shot, don’t be afraid to experiment on lighting, perspective, composition, and bokeh. There really is no single, sure shot formula because cliché at it sounds – practice makes perfect! Keep practicing until you’ll find what works for you depending on the result that you want to achieve. If all else fails, there’s always a next time so don’t forget to enjoy what’s on your plate! And perhaps, while at it, #CaptureTheRealYou and show everyone how much you’re loving the dining experience instead. So, you are thinking about putting up a blog this year. Should you buy a domain and hosting right away? It depends. If you are really serious about blogging and you have the budget for domain and hosting, that would be a good option for you. However, if you are having second thoughts and you just want to give blogging a try, or you simply do not want to spend money on domain and hosting yet, take advantage of a free website from Blogger or Blogspot. Login to www.blogger.com if you want to create a blog called phdocuments.blogspot.com. I have two old and un-updated Blogger blogs – phototecture.blogspot.com and litratorama.blogspot.com. I created them both back in 2007; I can’t believe they’re still out there in the world wide web! 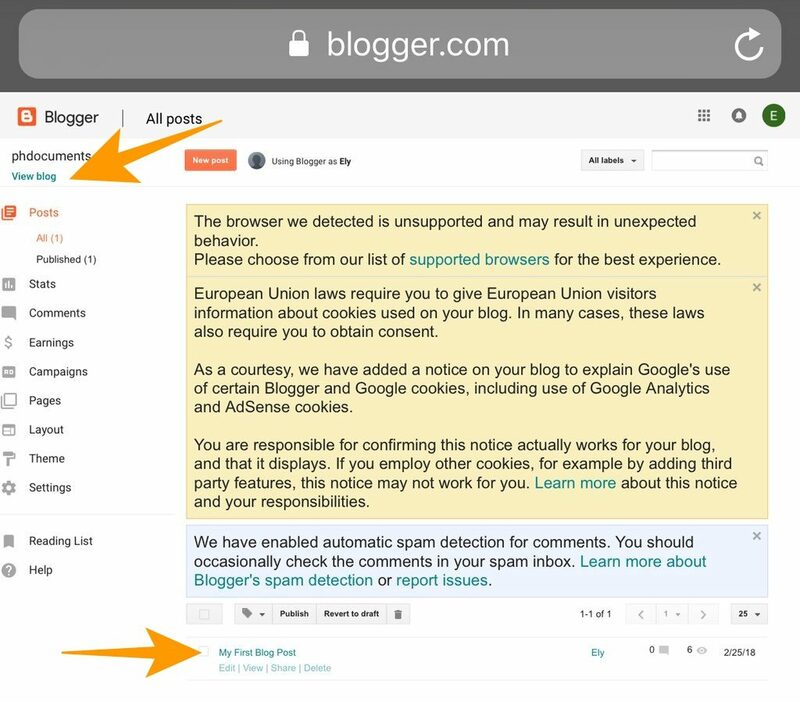 That’s the good thing about having a free Blogger of Blogspot domain; it will be kept for as long as Blogger or Google wants it to be there, and without you having to pay anything. 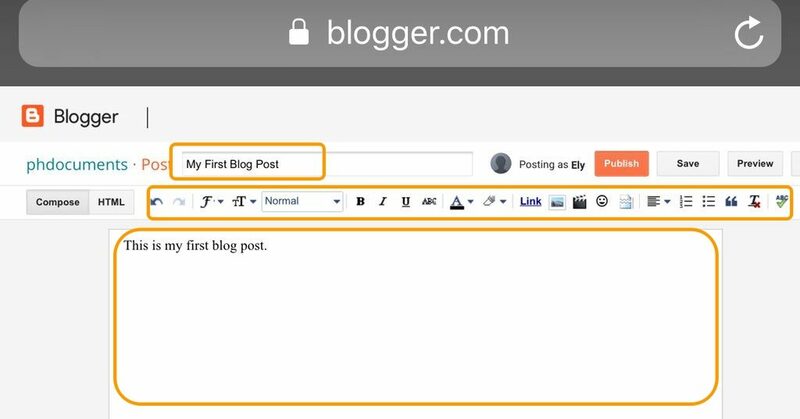 Here’s a quick guide on how to create a blog on Blogger this 2018, in six simple and easy steps. 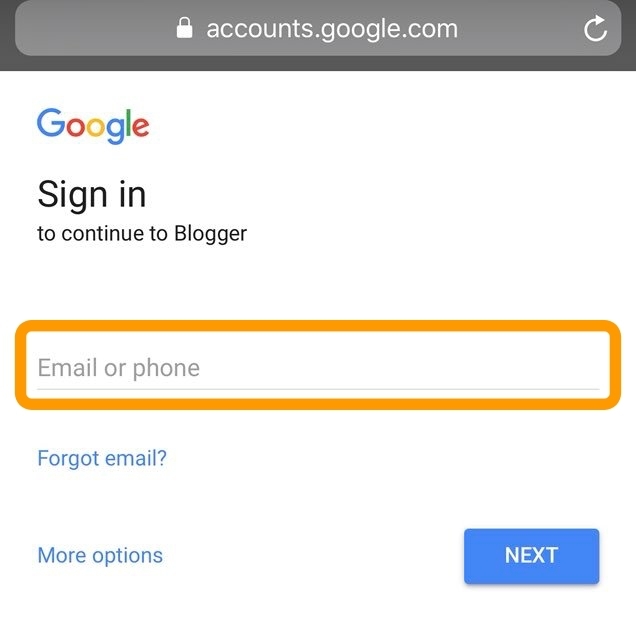 Go to www.blogger.com and create an account. 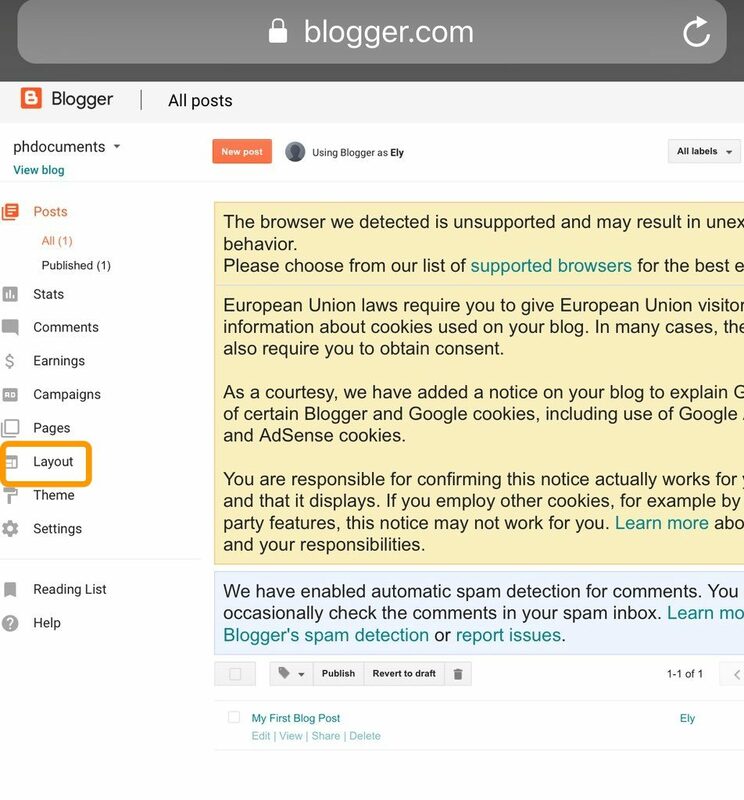 Blogger is owned by Google so you might want to use your Gmail if you have one, but any email address will do. Either way, Blogger will accept it. Upon signing up, you will be directed to your dashboard. This is where the posting and editing happens. 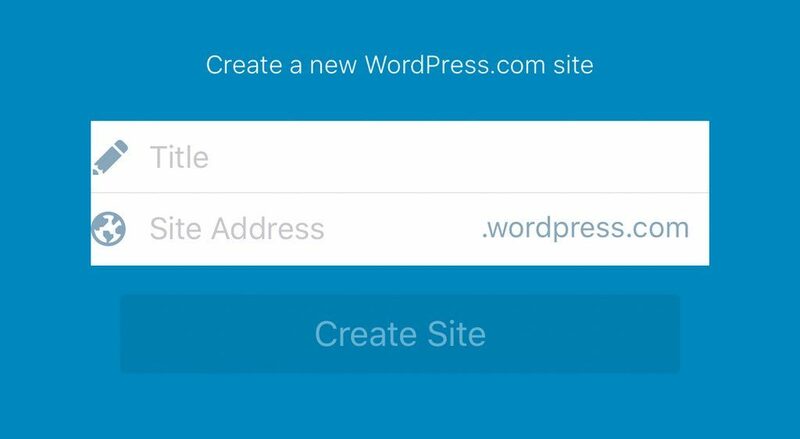 There really is no required sequence at this point, you can immediately create a post or continue building the site layout first. 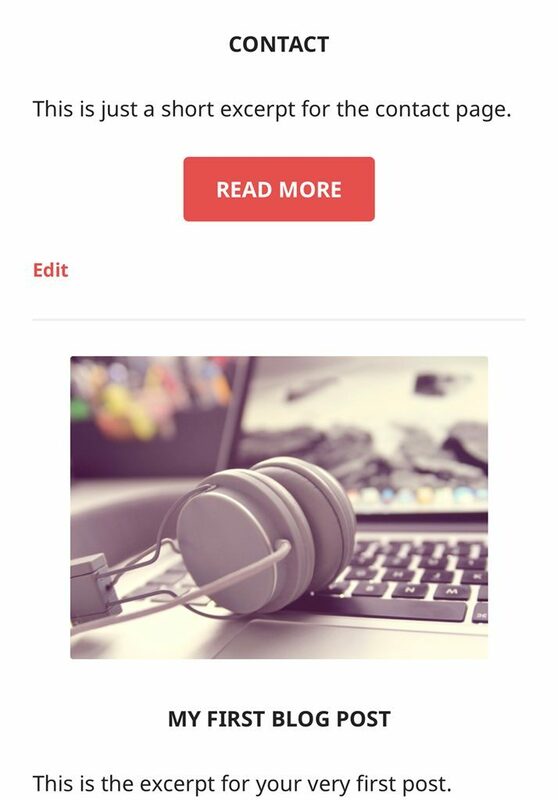 You may want to start on your blog’s layout. Click on the “Layout” section on the left (first image), and the layout options will appear (second image). Always click on the “Save arrangement” button for any changes you make. The layout shows you the available side bar locations. They are arranged accordingly for you to get an idea of where they are located in your page. One of the first things that you need to add are Widgets, or Gadgets. Click on the “+ Add a Gadget button” from any of the given locations to view your options. You can move these gadgets to your preferred location later on. This pop-up window will appear. You can simply select the basics from amongst these selections. You can always add or remove a Gadget later. For this example, let’s select Archive. You will get this Archive settings. You can type in any title you want, and select how you would like the gadget to look like from the given options. Do not forget to click Save. Or you can Cancel if you decide not to use the gadget. You will be redirected back to your Dashboard. 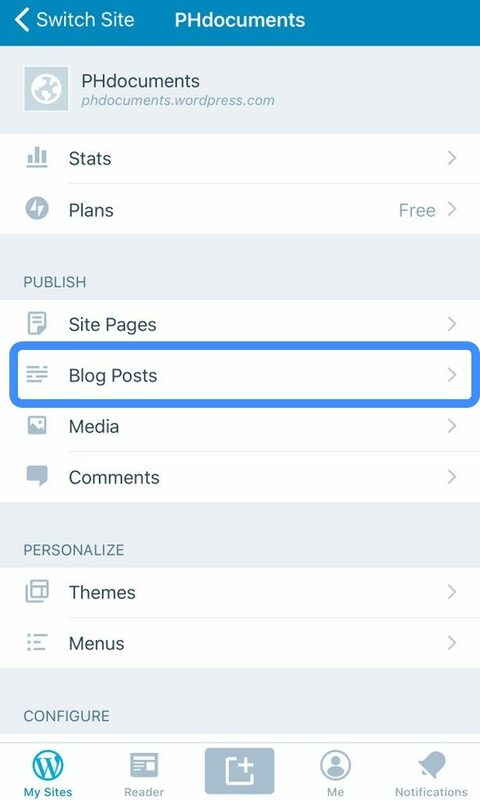 To add a post, either click on the “New Post” button on top, or the “Create a new post” link in the middle of your dashboard. 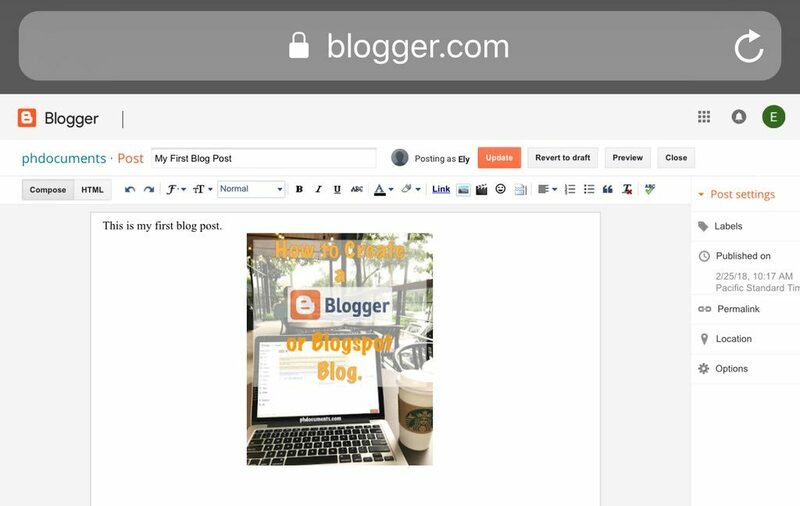 You will then get this window where you could type in your blog post title, content, and labels. You can use any labels, and utilize them as categories later on. You can add an image by clicking on the “image” logo from the menu bar on top. I selected the last image that I have on my phone. Yes, I used my phone to create these instructions and screenshots. 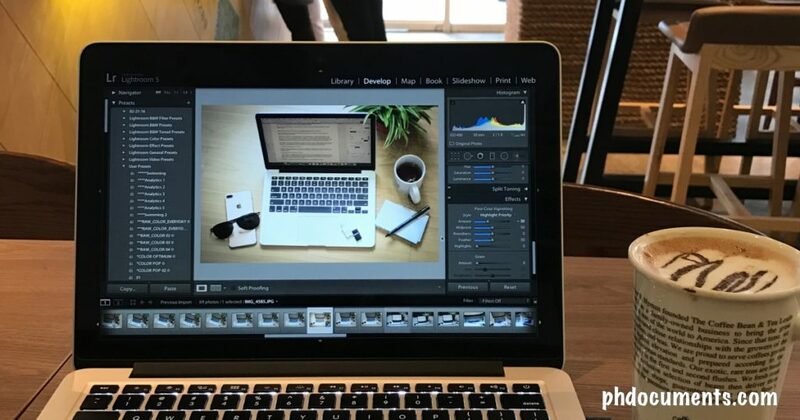 If you are on you laptop, you can select a photo from any locations in your computer. Make sure to click on “Save” before clicking on “Publish”. Again, you will be redirected back to your Dashboard. You will then see the new post that you created. Click on “View blog” at the upper left portion of the window to view your blog. 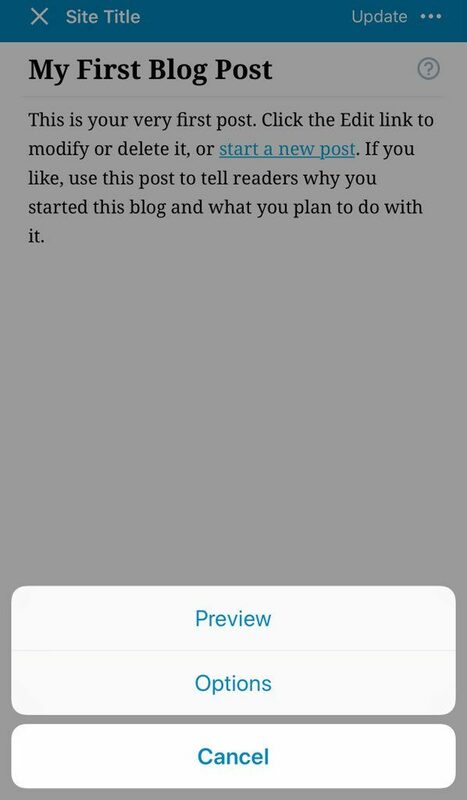 This is a preview of your plain blog, how do change it’s layout? Proceed to step 6. These are only the basic steps and you can finish them in less than 10 minutes! Work on your theme and layout as you proceed. You may want to try all free themes to see which one you would like, along with adding or removing gadgets. You can also upload and apply a theme from external sources; there are lots of free Blogspot themes available for download online and most of them are easy to customize. Take time in building and organizing your blog, don’t try to finish everything literally overnight. It will take hours and days of work until you get the layout and look that satisfies your taste and preferences. It’s a long process and that is fine, I guarantee that it will be a fun and exciting experience! I wish you all the best. 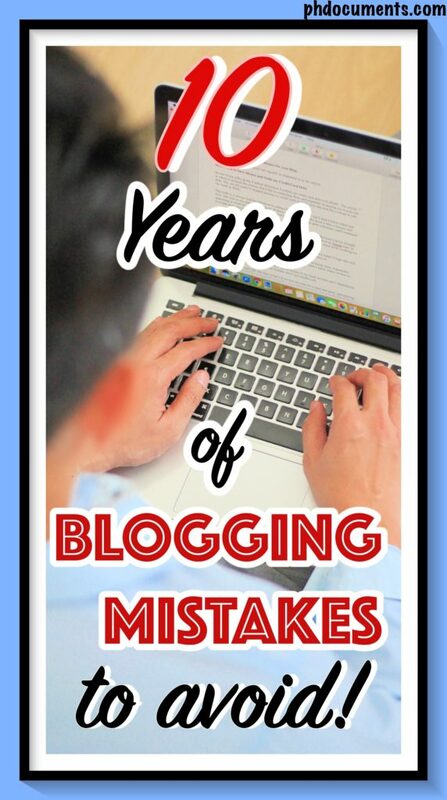 I remember joining my first blog contest ten years ago. My old page was just over a year old at that time, and Nuffnang Philippines just opened their second blog contest. Reading this post today, it’s so tempting to go back and edit. But I decided to leave it this way – raw and unpretentious. 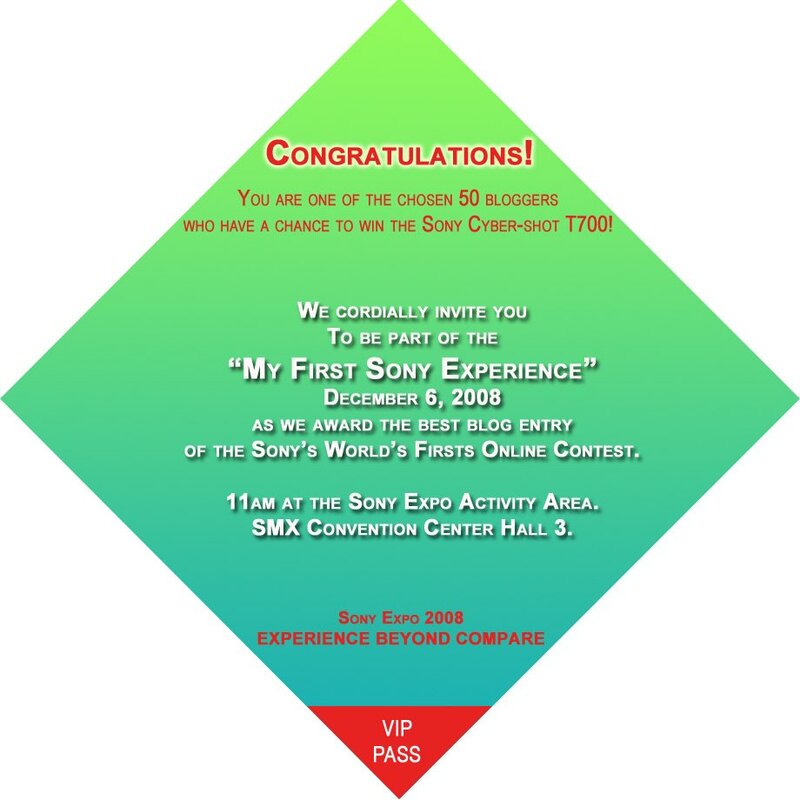 I was selected as one of the 50 finalists and received an invitation to the awarding ceremony. It was to be held at the then newly opened SMX Convention Center. Sadly, I automatically eliminated myself by not showing up. Almost a decade later, I decided to join another blog contest, this time through this site. 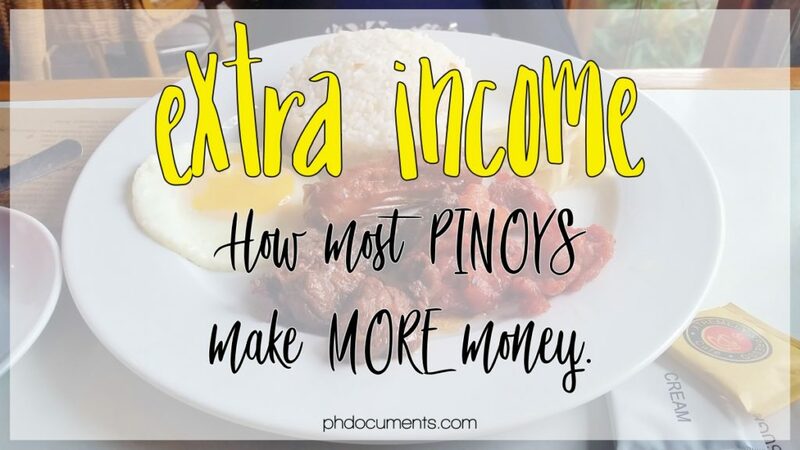 I got a P1000 Sodexo gift certificate. Not bad. 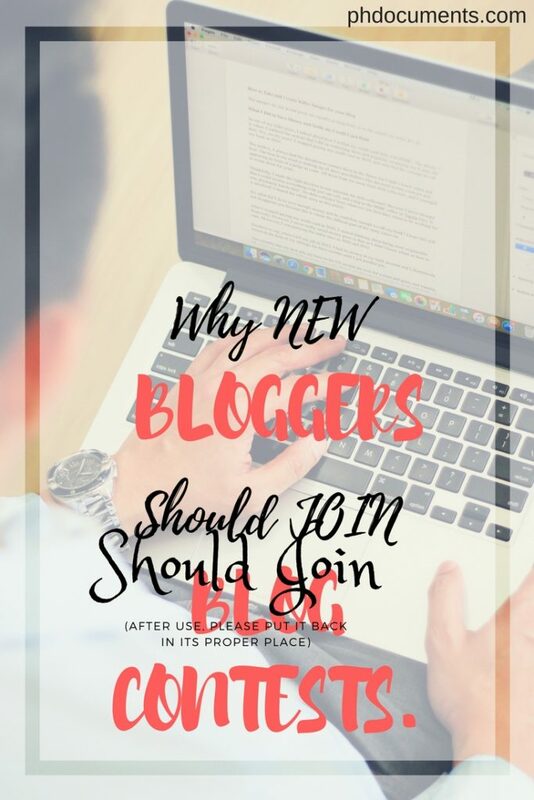 So, can new bloggers join and win a blog contest? Yes. Most of these competitions are open to both new and old bloggers. The newer you are, the more that you should consider joining. This site was just four months old when I entered the Sodexo blog contest. 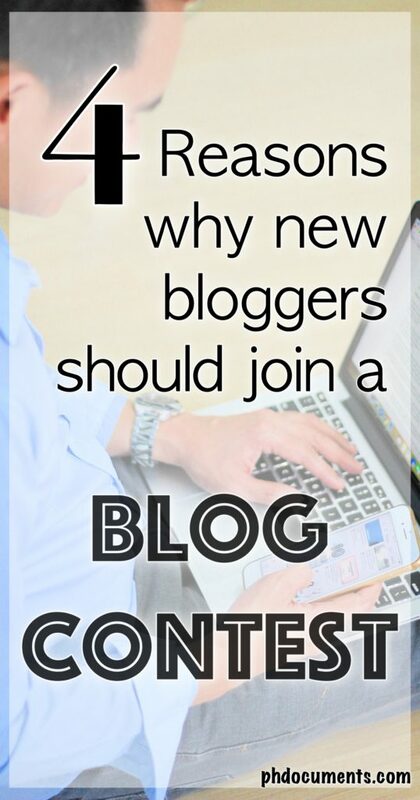 Why should you join a blog contest if you are a new blogger? Let’s see. Blogging may get boring after your first few months. A blog contest could keep the excitement going. From putting together your story, to publishing and submitting an interesting article, and then finally waiting for the results, the anticipation keeps you excited! Regardless of the outcome, you will for sure find something out of the experience to blog about next (hint: this blog post is an actual example!). It’s an opportunity to get creative. Writing a full article is already difficult. Writing an article and relate it to a topic which may not be very familiar to you is even more challenging. Being able to do so without sounding too promotional, and a**-kissing could land you a spot in the organizer’s short list. Win or lose, the experience will challenge you to improve on your writing. If you could produce high-quality posts for a competition, you can duplicate that for a regular post. Running out of new ideas and topic to talk about is normal. It is one of the realities that hit every blogger all the time. Joining a blog contest will not only push you to write something, but inspire you to create a high-quality post. You want to win as much as you want to publish another article, and you are sure that someone will scrutinize your post, so why not give it your best? If you have a niche, it becomes more challenging. Go for it! 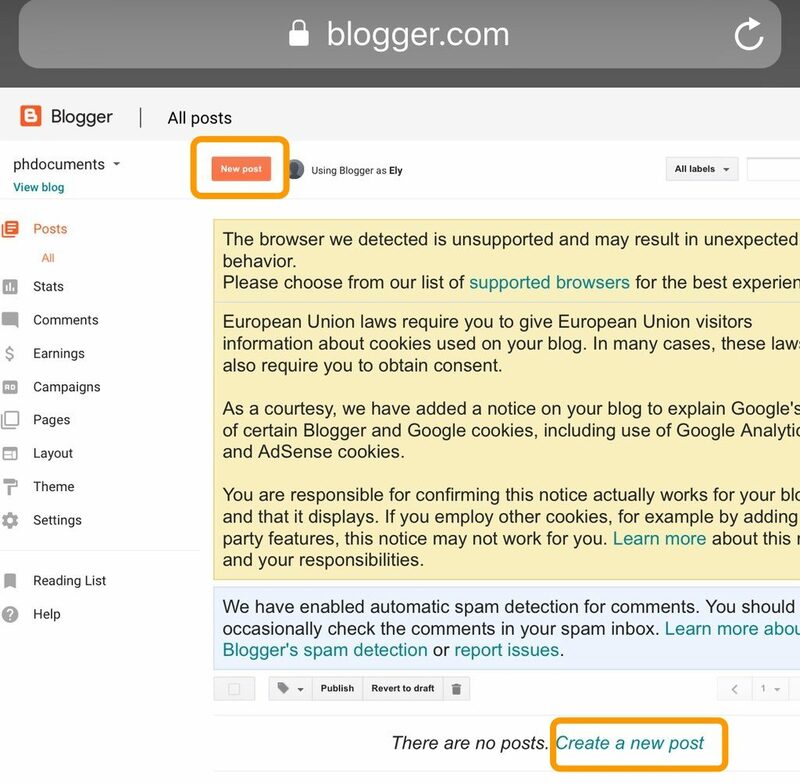 These are just one of the small risks that you need to take in order to learn, and improve your blogging. If you win, your blog will be published by the contest organizer. Not only that you get an instant monetary reward, Google will recognize your site even more. In the long run, the backlinks that your blog get from other websites will be your biggest prize. These links give Google the impression that your page is significant, hence, giving it a higher page rank. If you have doubts, just keep going. Join not only for the prize and bragging rights, but for the experience and lessons that come with it. 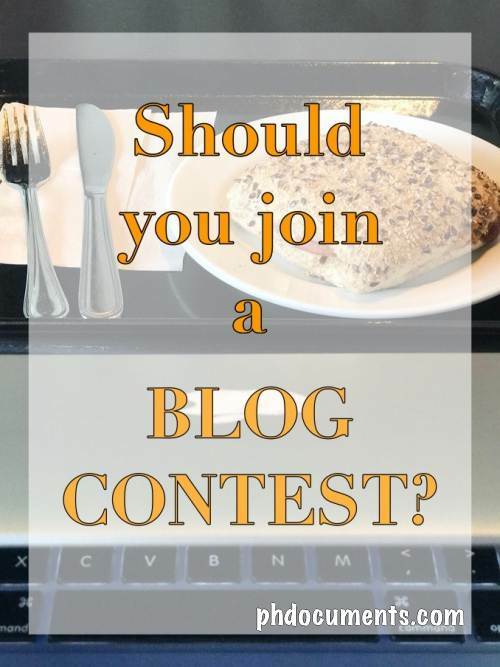 These blog contests connect you to other bloggers. You get to learn more about them and how they are doing in their niche, and consequently, on how you could level-up on yours. I wish you the best of luck on your first blog contest entry! Keep on joining! 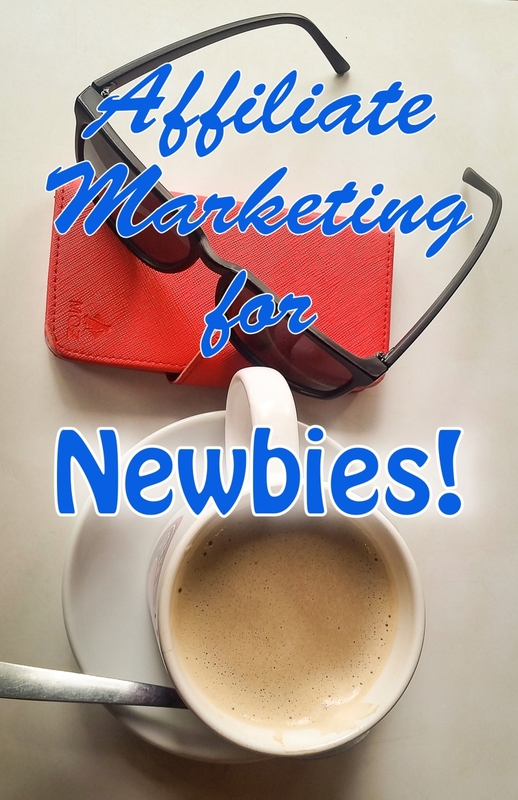 Back in November, I started learning my way around affiliate marketing as a “new blogger”. See, despite my 10-year blogging experience, I never really focused much on blog monetization. I never had the courage to take risks, and I admit, I was too lazy to learn. 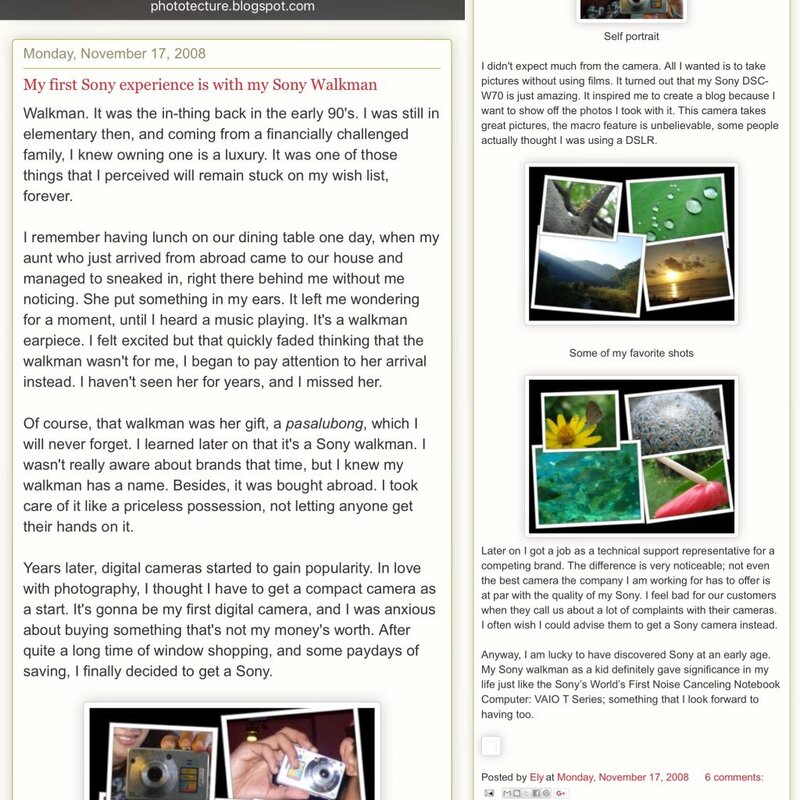 In the span of two years, from 2007 to 2009, I use to connect with several bloggers. It was just pure past time, and connecting was a way to attract followers. Although I ventured into paid posts just like most of them, I never really understood how one could make serious money blogging. I eventually stopped when paid posts became scarce. After a few years, my fellow bloggers who continued monetizing their blogs went on to become sources of viral articles. I would often see their posts being shared on social media. I was amazed and envious at the same time; I wish I didn’t stop learning! Fast forward to ten years later, here I am starting over again, eager and excited to explore more of what blogging has become. That’s how I came across affiliate marketing. 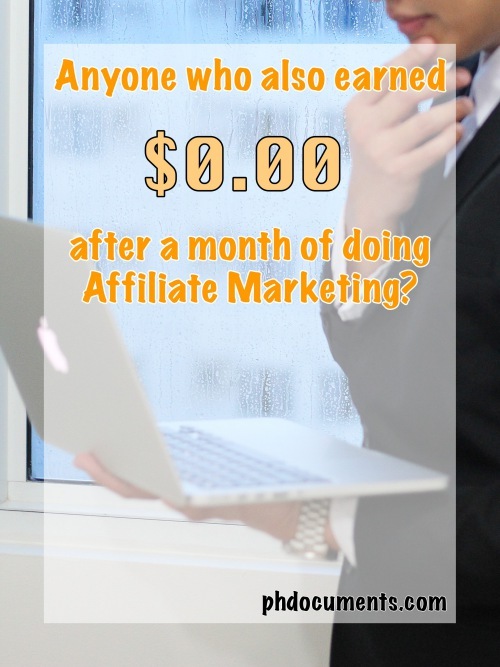 So how much did I earn after a month of doing affiliate marketing? Zero. Nothing. $0. Now, you must think I am crazy. Who in their right mind would want to embarrass themselves by publishing about a zero earning? And would anyone be interested to even read an article about not earning a single cent after a month of doing affiliate marketing? I don’t know either. But I did promise to share my experiences, and I think talking about starting from absolutely nothing is not really a bad idea. So what are the affiliate marketing programs that I signed up to? And what went wrong? Let me discuss. Amazon – Probably the most popular affiliate program available in the world wide web. While they have a very wide selection of products to promote, I find it difficult to find one that would fit in my blog. I thought gift cards are quite close, so I selected that for my first banner. Lazada – I think Lazada is popular amongst bloggers in Asia. While Zalora is for fashion and lifestyle bloggers, Lazada is more like Amazon, so it caters to a broader audience. I knew I cannot do Zalora, so I went for Lazada right away. I like the fact that they have regional offerings, so you can select one that targets your reader’s locations. Agoda – I thought it was appropriate to try Agoda as I am bound to publish travel-related posts at anytime. You get a commission for every booking made from your affiliate link; now I envy travel bloggers! JVZoo – I honestly do not understand JVZoo. Well, I guess it’s very typical for a newbie to try and explore things and later on asks “what was I thinking”? I am not comfortable at giving out my credit card details upon signing up, so I give this one a pass at the moment. But I’m pretty sure I’ll reconsider in the future. Bluehost – Since I started buying virtual real estates, I’ve always wanted to try Bluehost. However, GoDaddy has cheaper offers so I would end up ditching Bluehost. Bluehost nonetheless approved my affiliate application and I was very excited to start. A few days later, I received a notice about an issue in the tax form that I submitted. I never bothered checking what was wrong. Also, I realized that Bluehost may not be a perfect fit for my niche so I guess that ends my Bluehost dreams. Ironically, I would see Bluehost ads from Adsense being displayed on my pages so I guess that is it. GoDaddy – The only one that rejected me. It’s sad because I am a GoDaddy customer. I bought this domain from GoDaddy and subscribed to their hosting plan too. Oh, well. ConvertKit – Okay. This is most popular amongst bloggers that I follow. The problem is, I still don’t understand how it works so I haven’t started using it yet. It just looks complicated to me and until I get to fully articulate what ConvertKit is all about, I don’t want to be publishing anything about it. I know it may be simple for others, but as goes my tagline – “layman’s term” is what I am promoting. I want to be able to talk about it in my own simple words. Just like JVZoo, I am not closing my doors on ConvertKit yet. So there you go. So far, I am only actively publishing Amazon, Lazada, and Agoda at the moment which means I will need to have wide readership before I could actually earn something. But I am optimistic that I’ll be able to reach my first payout with them one day, and when that time comes, I will definitely be talking about it. This is my humble affiliate marketing journey. While I am a bit disappointed, I don’t consider my first month a failure. As what they say, it is just the beginning. I am still learning, and I know there’s a lot more to come. When I started this blog, I know I could monetize my content using Google Adsense, paid posts, and other forms of advertising. However, I didn’t know anything about affiliate marketing. Upon reading other blogs and learning about what affiliate marketing is, I got interested and wanted to know more. I am writing this as a newbie myself. Join me in exploring and discovering the ins and outs of affiliate marketing. What is an affiliate marketing anyway? From what I understood, and putting it into layman’s terms, it is a form of advertising where you (as the affiliate) gets a commission for every purchase made through your advertisement (in the form of banners or links that you post). 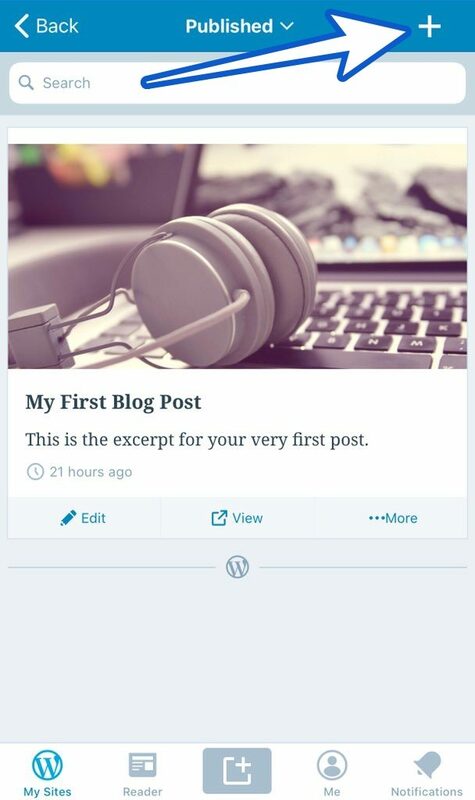 For bloggers, you can post the link within your articles or put up a banner in your side bars. This is not direct selling. There are many ways to sell or advertise without being pushy, most bloggers don’t even sound like they are selling something in their blog. Who could sign up for affiliate marketing program? Any content creators like us, bloggers. But as a blogger, you will need to have high-quality content that could make your blog convincing enough for your readers to trust. People will buy when they hear believable reviews from credible sources. 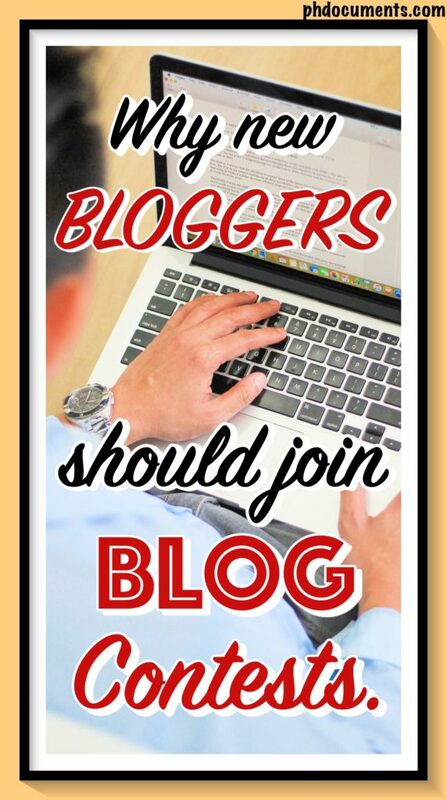 You want to be that blogger who is speaks and breaths credibility and honesty. How and where do you start? Sign up to available affiliate marketing programs online. From my research, the big names such as Amazon in North America, and Lazada and Zalora in Asia, are topping the lists. I am sure there are a lot more and I will have to explore those too. Now, you do not need to sign up to all of them. 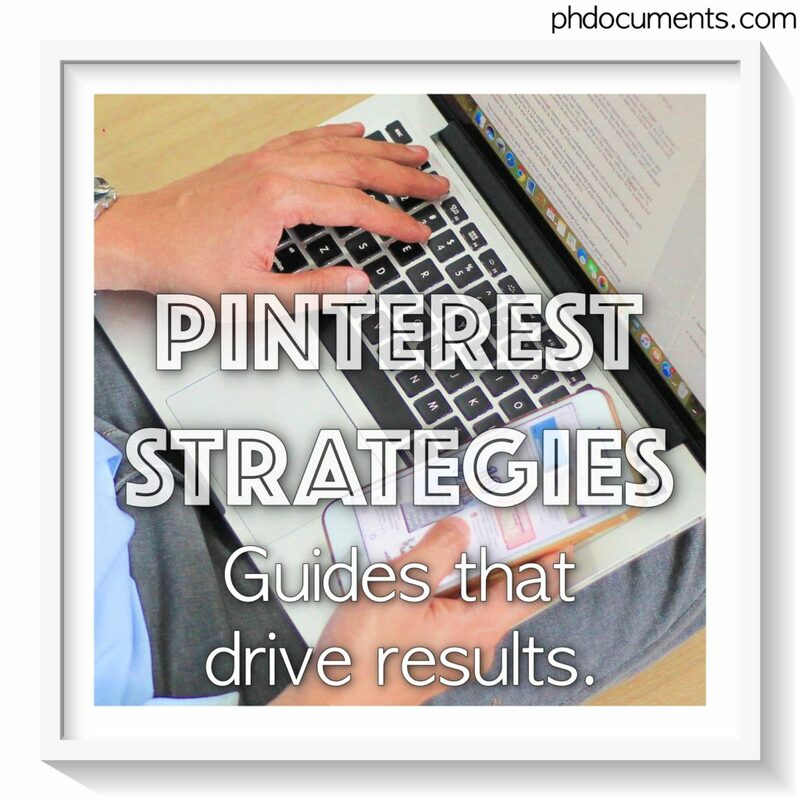 Find the best ones that fit your blog category. Zalora, for example, is a clothing store and is most appropriate for Fashion and Lifestyle blogs. Hence, I crossed it out of my list. What else do you need? A disclosure policy. I am drafting mine and will publish it as soon as I get approved by the programs that I signed up for. You will need to disclose that some of your posts contain paid links, or may be sponsored. All legit affiliate programs require a disclosure. More importantly, it not only shows transparency, but adds more credibility to you and your blog. Update: I just published my disclosure policy. Today, I signed up to one affiliate marketing program that caters to mostly Philippine audience. I am keeping my fingers crossed that I would qualify. I will be sharing my experience as soon as I receive a feedback. Wish me luck! Update: I got approved by Amazon and Lazada. However, despite their wide array of products, I am having a hard time looking for an item that could blend with the overall content of my blog. But I am still hopeful, nonetheless. I’ll give them a shot. I am not sure how far this would take my blogging but I am really excited. And I will make sure to document and share my experiences. Are you also trying your hand at affiliate marketing? Where did you sign up for so far? 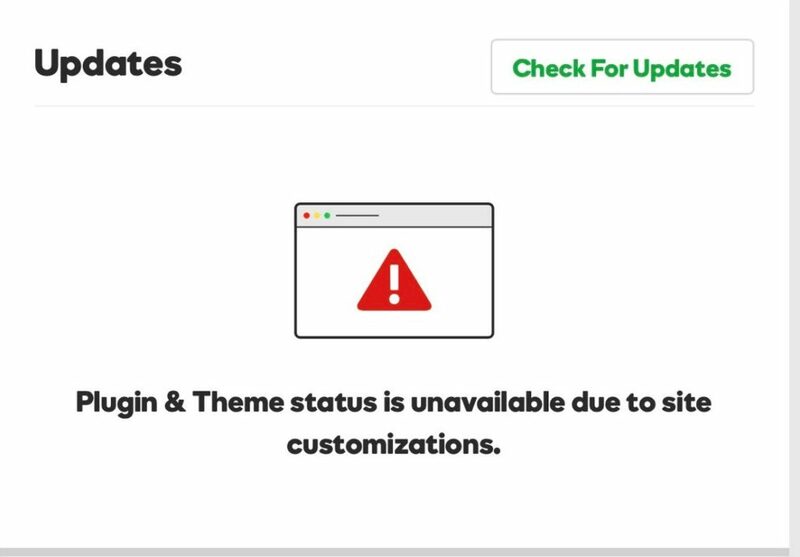 This error came up after I updated a plugin or theme. I couldn’t tell which one because I simply clicked on the “Update All” link when I saw it in my dashboard. My site went offline for over 24hours and I didn’t do anything about it as I thought it is just an issue with GoDaddy or WordPress (which often gets resolved quickly). I could not access my WP dashboard or CPanel. 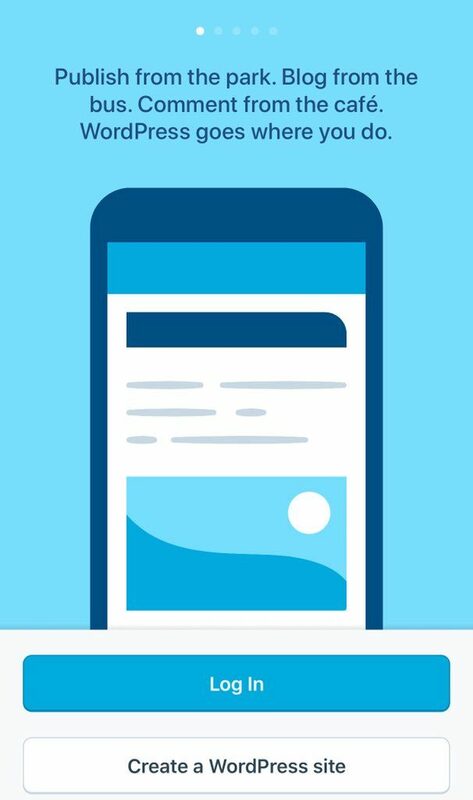 My site is just blank when viewed on mobile, and is displaying an Error 500 when accessed via web but the error is not specific. I looked up for solutions online but all the suggestions directed me to disable plugins which I couldn’t do because my dashboard is inaccessible. I called GoDaddy but the waiting time was too long. Thankfully, I was able to find the link to their chat support and got someone from the other end after 8 minutes. IMPORTANT: Make sure to backup your files; or contact GoDaddy directly for assistance in performing these steps. 1. 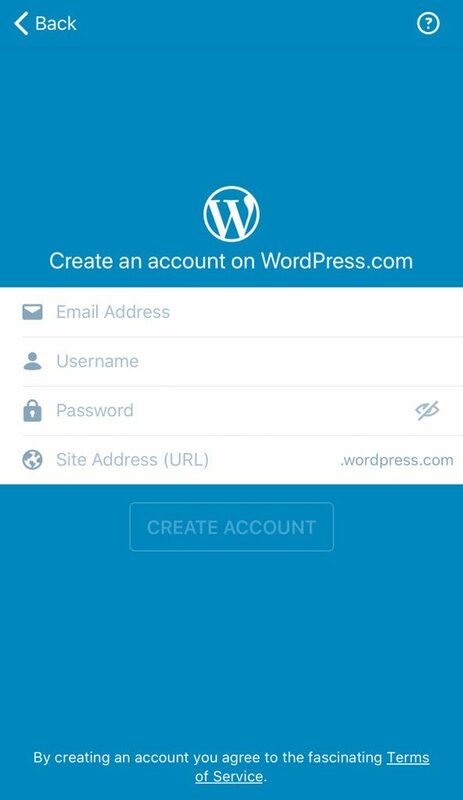 Login to your GoDaddy account, go to WordPress > Settings. 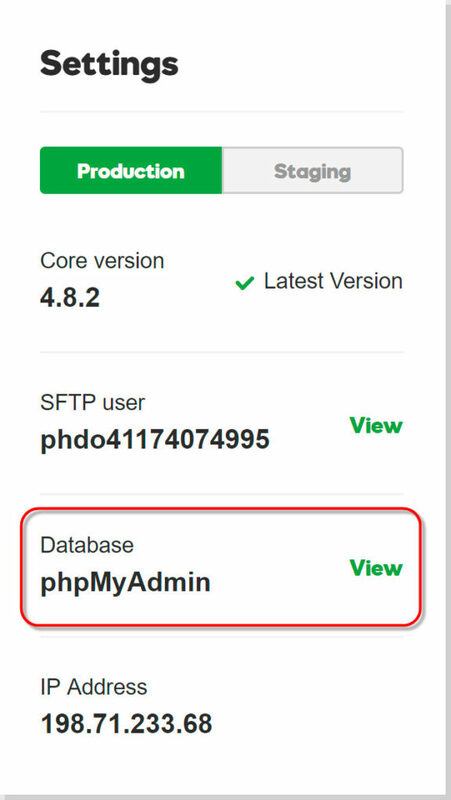 Look for “phpMyAdmin“, and click on View. 2. 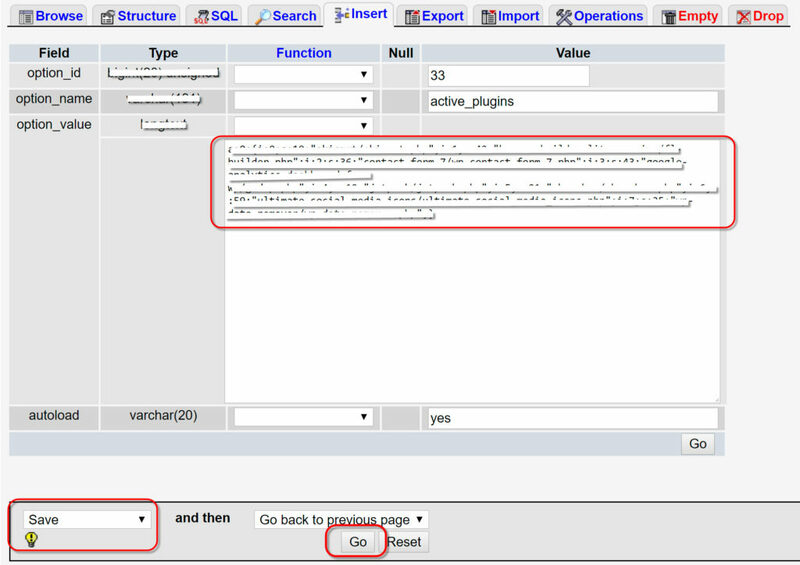 Click on “phpMyAdmin URL” and login using the given Username and Password. 3. 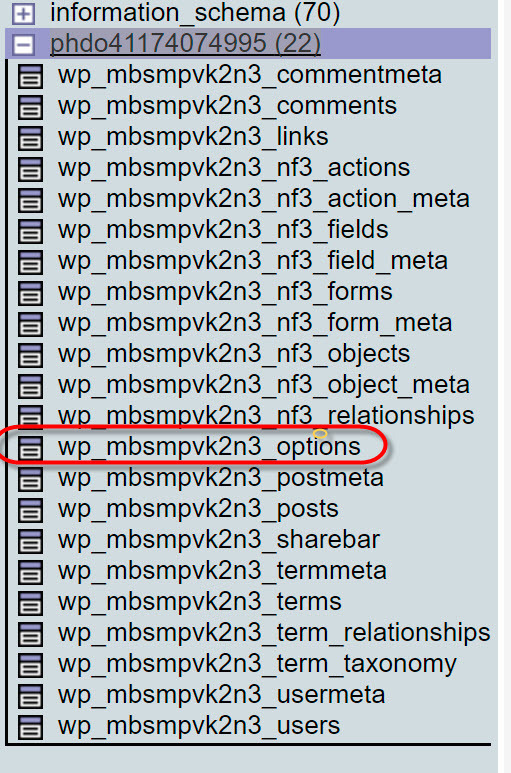 On the left, look for and click on the very small plus (+) sign beside your username (ex: phdo412345678) to expand the selection, and click on “wp_mbsmpvk2n3_options“. 4. 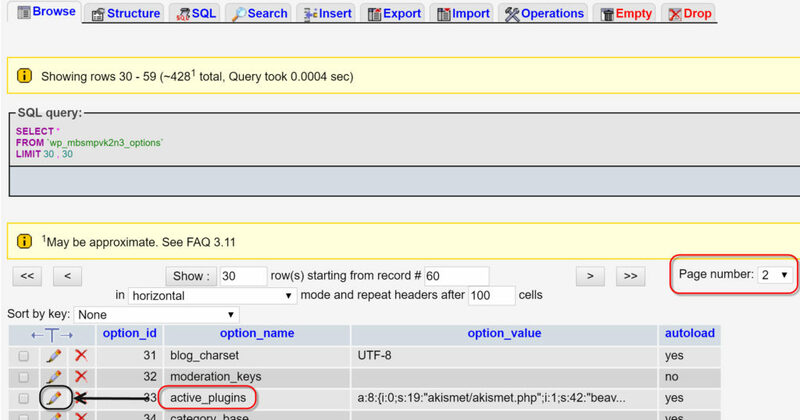 A table will be displayed, go to the Browse tab and look for “Active_plugins“. Go to page 2 if this is not on Page 1. Click on the edit option (pencil icon) beside “Active_plugins“. 5. 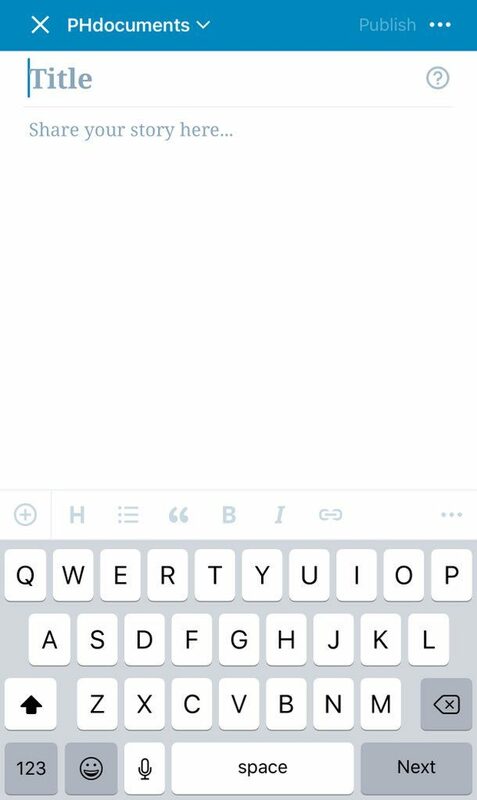 Clear or delete all the texts inside the box. Make sure that the Save option is selected before clicking on “Go” to save. Clearing this box will NOT delete the plugins, it will only DISABLE them. 7. Enable your plugins again one at a time. Doing so will help you determine which one has caused the problem, while bringing your site’s appearance back to normal (if it changed). If this does not resolve the issue, contact GoDaddy for assistance. From my experience so far, their technical support agents are helpful, and knowledgeable. You may just need to be patient at their often long waiting time. Anyway, have you experienced similar error before and got it resolved? Which plugin was causing it? This actually made me hesitant to update my plugins since. Experience is the best teacher, they say. 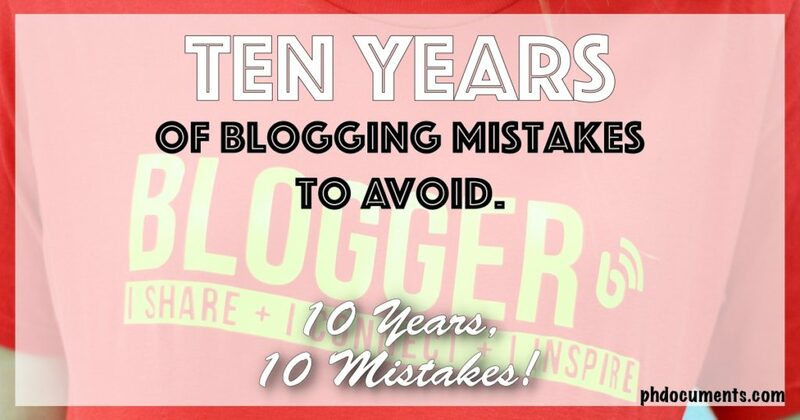 My ten years as a blogger taught me a lot but I failed to recognize that until recently. I wasn’t paying attention. I knew I have to keep learning but I was too lazy, and a lot of things were holding me back. So after a decade, I still haven’t made an impact in the blogging community. With the right mindset and strategy, some were able to find success from blogging within a year or two, and here I am just starting, again. While this may have enticed you to start, don’t fall into the trap of building a blog and expecting to earn money right away. 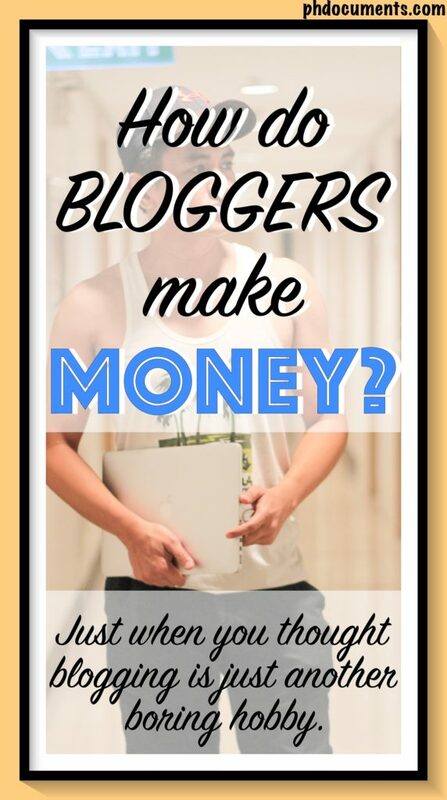 Yes, you can earn money from blogging, but not after a lot of hard work, dedication and focus. For some, the monetary gains start to happen after six months to a year, or years. And this is not to disappoint you, but it may not even come at all. The truth is, if you want to monetize your blog, you have to offer something extra to your readers. You receive what you give, so be mindful of what you are giving. Focus on the value of what you are offering, people acknowledge that when they see it. You may have at some point shared some articles, videos or links on social media about things that you find relevant. You may have liked and followed pages on Facebook which are not celebrity-owned. You did that because you saw something that it is of value to you, got inspired, amused, or touched. So if you are not receiving enough from your blog, you may not be giving enough. I started this blog after establishing its purpose, the purpose why I am blogging, and why this niche. I aim to share, with hopes that what I am sharing would be of use to others. It is important that there is a reason behind the blog, not just the blogging. Keep in mind that your purpose and intentions could help you determine a niche. What are your intentions? I intentionally used the phrase “layman’s terms” in this blog’s tagline for obvious reasons. I hate technical terms, and “SEO” and “Google Analytics” are one of the many jargons that I avoided for years. I failed simply because I chose to not understand things which I find complicated. Wrong. Make sure to learn these as you start creating your blog. There are lots of free online references available, use them. You don’t have to be an expert on this subject, again unless you intend to be one. While I still am unable to articulate SEO or Google Analytics in a way that I could make them a topic for a blog post, I now get the idea. Gaining knowledge about these tools helps, don’t be afraid to explore them, and use them! My fellow bloggers have been convincing me to to get my own domain since 2008. I did not listen to them. At that time, I didn’t have any plans to monetize my blog so I thought purchasing a domain and getting it hosted are money wasted. The thing is, you do not really need your own domain in order to monetize your blog. A .blogspot.com blog would do. Why do you need a domain then? It simply is more appealing, it looks and sounds more professional. 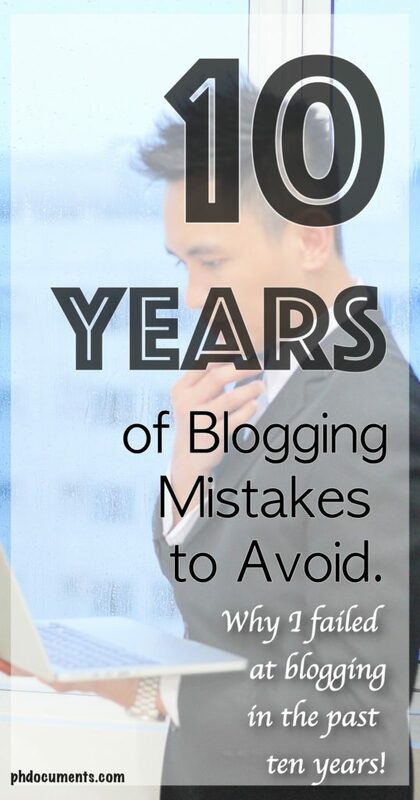 And if you have been blogging before, getting your own domain is a milestone. It is taking your blogging to the next level. Bluehost is one of the best web hosting out there where you could also purchase a domain along with the hosting. If this is your first time to blog, number six is for you. If you are new to the world of blogging, buying a domain may not be a very good idea yet. You may need to explore and experience things that goes around the Blogosphere first; I highly recommend a .blogspot.com blog. Not only that it is easier to manage, but Google loves it! Back in 2015, I closed my old domain and started a new one. I had a plan I was very excited about so I purchased a domain right away. Only three articles later, the excitement started to fade away. I stopped posting after five months, and just like that, I threw away a year of domain and hosting subscriptions! This is the reason why it took me two years to decide to start again. I’ve learned my lesson, and that is one of my inspirations to come up with this list. Yes, you do really need to be “open-minded” about this. A blog is still a social media, and just like Facebook, you need to have friends in order to have an active timeline. I had over fifty solid connections in the Blogosphere eight years ago, and I regret the fact that the connection was not sustained and I stopped making more. Indeed, patience is a virtue. It’s good to let go of all the expectations first. 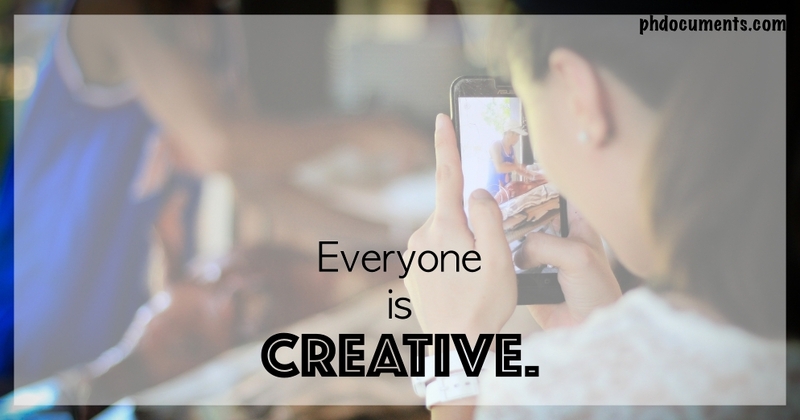 Instead, keep building your blog with quality posts as the priority. Your posts are your foundation. Build your foundation in the first three to six months, make it deep. So deep that it will be strong enough to handle success! I am impatient myself, I use to want to publish three to five times a week that I ended up posting random articles in my old blogs. I sacrificed the quality, I had no clear intentions other than to post something, just anything. Well, I know now that that is not how it works. Always prioritize quality over quantity. When I learned about “niche”, I started looking at other people’s blogs with the intention to copy what they are doing and expect to be as successful. Another mistake. In order to stand out, you have to be different. Be inspired and learn from someone you look up to but don’t be a copycat. Do not overthink! While it’s true that all topics are (maybe) taken, there will always be something you can offer that others can’t. You can write about a similar topic and add your personal “touches” to it. We may have related experiences, but no two experiences are exactly the same. This is one way of taking advantage of your individuality. Never. Blogging is still at its peak. Blogging in the Philippines is still very active. Vlogs will not kill blogs. I’d say blogs are here to stay and will continue to dominate search engines. Visit the website of any company you know, and there will always be a link for “blog” or “news” in their main page. That is how they survive online, more than just selling their products or services. For us bloggers, our blog in itself is our product. Keep on writing and sharing. It’s true that there are lots of negative impressions about blogging and bloggers. Do not focus on those. 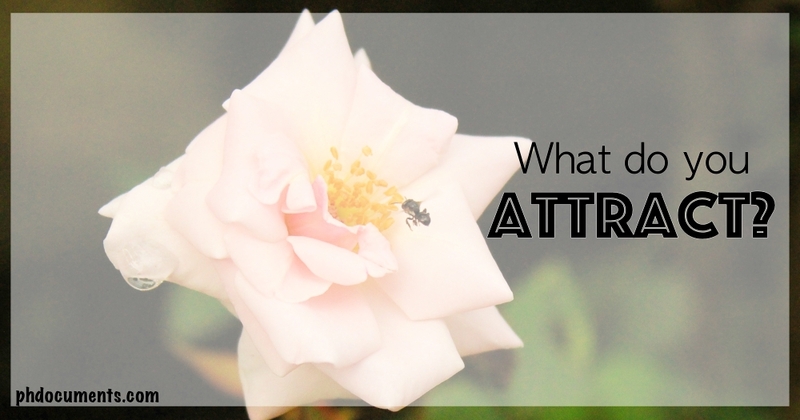 Instead, aspire to be one of the bloggers who spread positive impressions (and earn those page impressions)! I wish you the best of luck on your blogging. Be an inspiration!